Vida Blue by Susie Perez Fernandez is the story of a young woman named Ariadne Cordero, who goes by Ari, as she deals with abrupt and unexpected changes in her life following the departure of her partner, Santos. Ari is the ideal woman: young, beautiful, intelligent, and wealthy. As she collects the pieces of her life and makes a transatlantic move, a series of introductions and men filter into her life in what, by all accounts, feel like happy accidents. As a renewed sense of affection and longing blossoms, Ari questions her feelings and motives. It isn't until she is catapulted into the dark machinations of danger that lurk behind every smile and around every corner that Ari is forced to confront a life - her own life - in danger and a heart that yearns to live and love once more. Vida Blue by Susie Perez Fernandez will sweep readers across the globe with a narrative and plot that cross borders nearly as much as the story itself steers the heart rate up. This is an action romance, something we don't come across as often as we'd like, and the scheming that is drawn out by the author is spectacular. The characters are engaging (particularly Ari and her friends), and in a rich twist that starts at the book's beginning, the reader is hooked with questions, the answers to which are only slowly revealed. It's rare to find a story where every page is packed with suspense, but the pacing is even-handed and smooth. In less skilled hands Vida Blue might have felt rushed, but Susie Perez Fernandez has written a book that provides a perfect blend of energy, action, and...of course...romance. 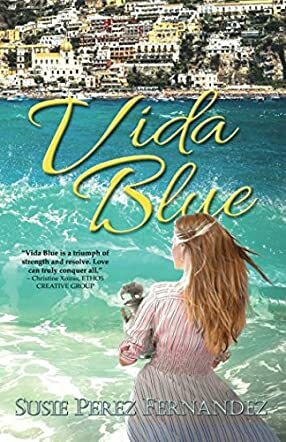 In Vida Blue by Susie Perez Fernandez, after suddenly losing her husband, Santos, a heartbroken Ari decides to return to the place they were going to make their future home, the idyllic coastal town of Positano, Italy. As Ari struggles to adjust to life alone, she meets Avinash, a successful, charismatic ladies' man. Neither is looking for love, but the instant chemistry between them cannot be ignored. As their love deepens, an old enemy of Avinash resurfaces. He wants revenge and Ari becomes the main target. She turns for safety to Marcelo, a self made man with a dark tragic past. Ari discovers that all she had cherished has been built on lies. Marcelo’s friendship has an ulterior motive and the death of her husband has links to Interpol and Scotland Yard. Revenge and hatred are disguised behind the smiles of friendship. Ari tries to discover who she can trust while trying to stay alive. As the enemy closes in, Ari must decide if Avinash is where her future happiness lies. A story of love, heartbreak and dark secrets of the past, which will take you from Europe to Los Angeles. The author has an excellent ability to build a scene that is visually compelling. The plot is superb and constantly moves forward at an enjoyable pace. It has so many layers that are slowly peeled away to reveal even more questions. The subplots are equally as strong, and have been cleverly entwined into the main story. There is a perfect blend of suspense, action and romance to keep the reader engaged. Each character is detailed and authentic, particularly Ari and her zany friends. The love scenes are heartwarming and together with the tension, as the enemy tries to find Ari, this book kept me gripped until the end. When I thought I knew what was going to happen, the story line would take me in another direction. If you love your romance novels to have a gritty realism, then this book is perfect for you. Vida Blue by Susie Perez Fernandez is a suspenseful blend of romance and adventure with vivid and exciting settings. When Santos Echegui and Ariadne planned to buy a house in Positano in Italy, they couldn’t imagine life being different from being together. But they are separated by a tragedy that forces Ari to live alone. In this story of heartbreak and a woman’s gritty search for love and redemption, the reader follows Ariadne as she gets involved with Avinash Batra, a handsome man who will put Ari’s life in the cross fire between him and an old enemy. Meeting Marcelo seems to be the best refuge for Ari, but then she quickly learns that the sweet-talking gambler could be more trouble than what he lets on. And can her group of female friends give Ariadne the protection and peace she hasn’t had since losing Santos? This is a spellbinding story that follows the climates of one woman’s heart. The premise is very strong. It opens with Santos, bent on accomplishing a dangerous mission, even against the wishes of the one he loves. He is hunting for important evidence in a desolate warehouse and combating inclement weather. The narrative is done in great and gorgeous prose and Susie Perez Fernandez gets readers to navigate the intricacies of the hearts of the characters. Ariadne is a well-imagined and beautifully written character who will remind many readers of real life situations — the pain of loss and the thrill of human embrace. I enjoyed the way the author captures the need to fill the void after one loses a loved one. The writing is filled with insightful lines and right from the beginning, in a stream of consciousness, the narrator uses a line that captures the stubbornness of heart that describes the humanity of the characters: “Why is it that when someone tells you not to do something, you seem compelled to do the opposite?” Vida Blue is a great read with real characters, a story that reflects the inner workings of the human heart in powerful ways. So real and so engrossing, with exquisite prose. I had the chance to recently meet the author Susie, who is a wonderful person! Once you start reading Vida Blue you just want to keep on reading one page after another without stopping! Amazing person and very talented author!